It's time to transit into an era of exciting 1-for-1 travel and accommodation deals. This #HotSummerNights and #TravelMore campaign arrives just in time for the summer holidays, and provides an ideal opportunity for YOU to take a well-deserved breather. Families can leave their myriad of technological devices at home and go on a bonding trip, undergraduates can refresh and recharge in between semesters, and those who have recently graduated can take this opportunity to enjoy the offers for their grad trips! Here are 5 Bluest pools for the avid traveler to dip into. Scroll down to find out how you can win The Entertainer mobile app (worth $60) – 2 lucky winners to be chosen! The ‘Hot Summer Nights’ promotion features an amazing selection of hotels and resorts throughout the Middle East, Asia and the Indian Ocean. Fairmont Bab Al Bahr boasts a prime location at the mainland gateway to the cosmopolitan city of Abu Dhabi. With its contemporary design, this beachfront hotel offers the highest level of comfort and elegance throughout its 369 guestrooms and suites. It offers unrivalled views of the Sheikh Zayed Grand Mosque and easy access to the Abu Dhabi International Airport, and also houses a variety of world class restaurants, a private sandy beach and a lap pool. Radisson Blu Resort Fujairah is located along a 500 metre private beach in picturesque Dibba, along the UAE’s East Coast. It lies 40 minutes from Fujairah City and 90 minutes from Dubai. It offers 257 beautiful rooms and suites which are elegantly decorated and boast terraces with sea views. The resort features three restaurants and bars, and other facilities include a spa, health club, five outdoor swimming pools, a diving centre and a children’s play area. Water sports activities are also available. ‘Velavaru’ means ‘turtle island’ in Dhivehi, the national language of the Maldives. Stay in a resort where you can experience marine life at your doorstep. All the villas overlook the ocean and offer a sweeping panoramic view of miles and miles of cobalt blue water. 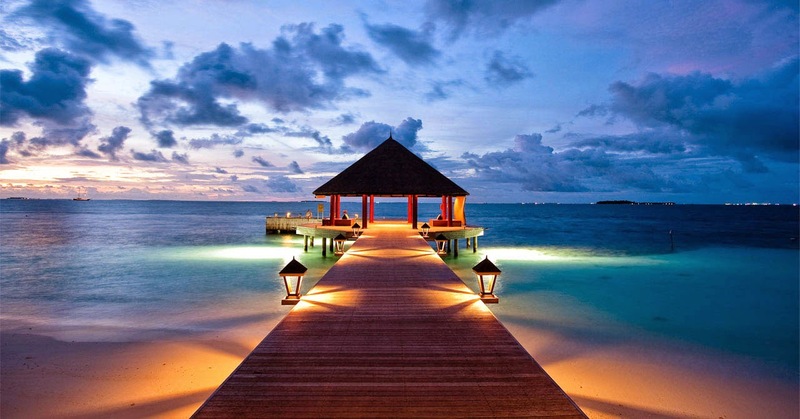 The InOcean Villas are suspended over water, on stilts – the first of their kind in the Maldives. The resort is uniquely Maldivian with ‘cajan’ (coconut leaf thatched) roofs over the island villas and sandy floors at the restaurants, bars and lobby. Millennium Resort Mussanah features a four star hotel overlooking a 54-berth marina. It is nestled on the coast along the Gulf of Oman and the Hajar mountains. Featuring 234 guestrooms and 74 furnished apartments, along with 7 food and beverage outlets, a beach club and pool bar, an 18-hole mini golf course, swimming pools, a kids club and park, a spa & fitness centre and Oman Sail Water Sport and Dive Centre, it is located a short 4-hour drive from Dubai or 45 minutes from Muscat International Airport. Dive into the sparkling waters off an exotic coral island from the beachfront of this villa. Hidden among fresh vibrant greenery, the villa comes with a verandah with dining facilities, an outdoor swing where you can sway lazily while reading or meditating, an outdoor shower and your very own jet-pool. 1. One night and get one free. 2. Two nights, get two free. 3. Book three nights and get three free. Depending on the hotel selected and length of stay, you could save up to $2,500! For more info, please visit https://www.theentertainerme.com/hotsummernights. Look out for the travel offers marked with a trophy icon on your mobile app! This indicates that they are part of #HotSummerNights. All the best! Winners will be announced on 15 June 2015. Images are provided by The Entertainer.